It’s AD 2050, and humans are waking up to the reality that scientists have lied to them — the sun is dying and with it a civilisation they have painstakingly built over the course of a hundred and fifty thousand years. A skinny albino boy, fifteen years old, pulls a T-shirt over his head as he walks out of a cosy bungalow and grins up at the red sky. He’s the only human alive who’s happy to see the sun on her glorious deathbed; it’s a relief to not have to wear hats, sunglasses and long-sleeved shirts any more. The scientists no one trusts say that the sun has a few weeks to go; days even. The boy’s scuffed sneakers kick up snow as he makes his way down the stairs from the porch, and he smiles again. Ten years ago, before the gold of the sun bled out, leaving in its stead a pale red, it would have been a blistering hot day, and any suggestion of the possibility of snow in these parts would have been laughed out of the door and blamed on the many American shows that had taken over African cable television. Now Uganda is experiencing its first winter and one of the greenest countries in the world is now as white as… well, snow. Inside a large frosted-glass dome, the boy sees the rounded figure of his caretaker, Nyambura. The dome is one of many advanced greenhouses that have popped up all around the world in the past decade as a food source and haven for Earth’s nearly depleted plant kingdom. Nyambura moves towards the dome’s opening and the boy grimaces, trying to move as quickly as he can towards the gate. It’s futile. “Red Sun! Don’t you dare walk out of that gate without a jacket and your oxygen tank!” Nyambura shouts. She is a plump woman, her face shrewd and her skin smoother than one would expect of a 65-year-old woman. Nyambura has been taking care of Red Sun since he was a baby. It is she who, after his parents left in the Mass Exodus, named him Red Sun. She claims that the sun turned red on the exact date of his fifth birthday, but he knows there is more to it; it’s a private joke between her and the lanky, one-legged askari who is Kenyan, like her, and laughs every time he hears or says Red Sun’s name. The look on Nyambura’s face forebodes another lecture on respect for elders, but she surprises him by crossing the snow-covered compound to hug him. Bemused, he looks down at the colourful scarf covering her greying hair, and a spurt of rage overtakes him. Acan Innocent Immaculate is a 21-year old Ugandan pursuing a Bachelor’s degree in Medicine and Surgery. Writing has always been her first love and she looks forward to a literary atmosphere where African stories will break the mould even more than they do now. Acan is the winner of the 2016 Writivism Short Story Prize. 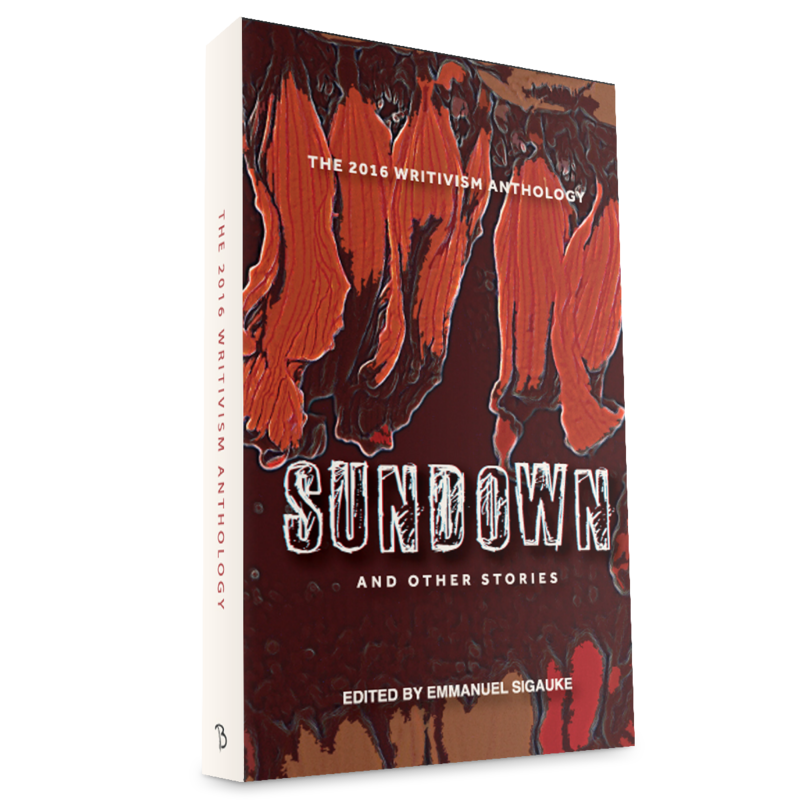 “Sundown” won the Writivism Short Story Prize and is published in The 2016 Writivism Anthology: Sundown and Other Stories. R199, paperback. Order it directly from our shop site. Available from Amazon, Createspace, Turn the Page Africa, Magunga Books, OkadaBooks, African Flavour Books, and other good indie bookstores.